This story is, in a word, charming. The Monsters’ Monster is the tale of three tiny monster friends who constantly bicker over which of them is the biggest and baddest monster. Ultimately, they can’t make up their minds and decide to create the biggest, baddest monster together, using some comical and unthreatening ingredients. In short order, their towering Frankenstein-like creation emerges and, to their horror, ends up being a total sweetheart. He showers love on all the rats, snakes, bats, and spiders in the gloomy castle, and he hugs his creators with an enthusiastic, bellowing “Dank you!” His zest for life leads him to town in the early hours of the morning to buy jelly doughnuts. The confused little monsters follow him and they all end up sitting at the beach, watching the sunrise while eating their jelly doughnuts, giggling and smiling. 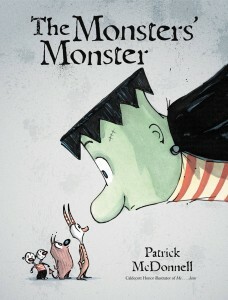 The Monsters’ Monster is one of those gems that adults will look forward to reading almost as much as the kids do. It lacks the saccharine morality that seeps into so many children’s stories and instead uses quirky humor to illustrate how love and compassion win out over tantrums and crankiness. You will fall in love with the big monster. And his constant refrain of “Dank you!” will be a pleasant role model for one’s own youngsters. The author and his wife are both vegetarians, and his love of animals is evident in this story and in his earlier works. Indeed, his website dedicates a page to “animal and environmental friends.” The only hiccup for vegan parents might be the mention of the jelly doughnuts, but with all the fabulous vegan cookbooks and bakeries popping up, this is becoming a non-issue. The publisher LB Kids sent a copy of this book for review on Vegbooks. I’m so bummed that our library doesn’t have this book, your review made me think it would be perfect for my kids!